What is the Custom Resolutions/Modes feature? Add custom modes for display devices attached to your computer. Correct compatibility limitations of graphics and display hardware. 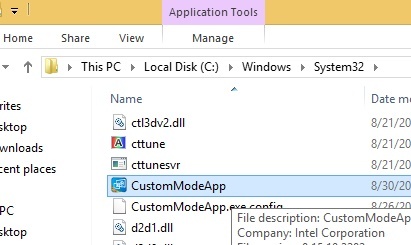 Set a custom mode for better operation of software that requires a specific mode not enabled on the display by default. Do I have the Custom Resolutions/Modes feature enabled on my computer? Verify you have the latest Intel® Graphics Driver. 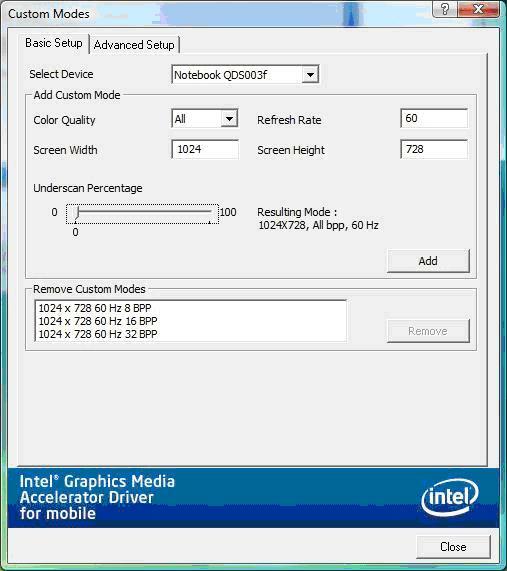 Note Custom Resolutions/Modes isn't in the Intel® HD Graphics Control Panel. You must create a mode. 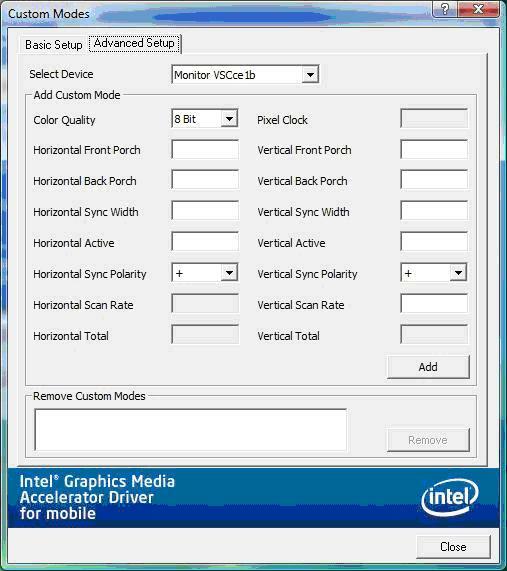 After verifying, check the Intel® Graphics Driver properties window to see if the feature is available. 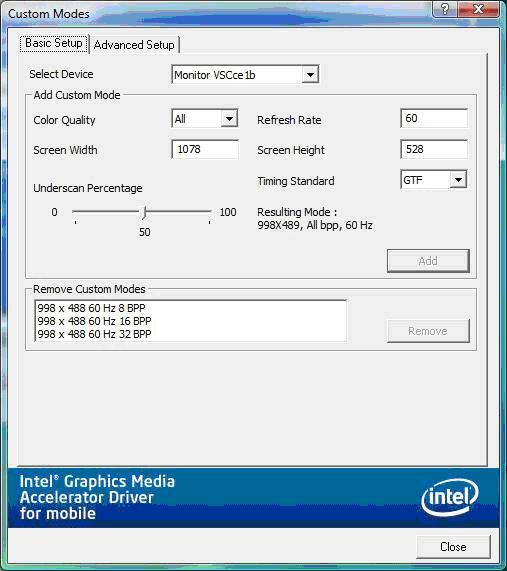 To open the Intel graphics properties, simultaneously press Ctrl, Alt, and F12 or right-click the Windows* desktop. Select Graphics Properties. If prompted to select an application mode, select Advanced Mode. On the Display Devices tab, check if the Custom Resolutions/Modes button is available. If you don't have a Custom Resolutions/Modes button, you haven't enabled the Custom Resolutions/Modes feature on your computer. 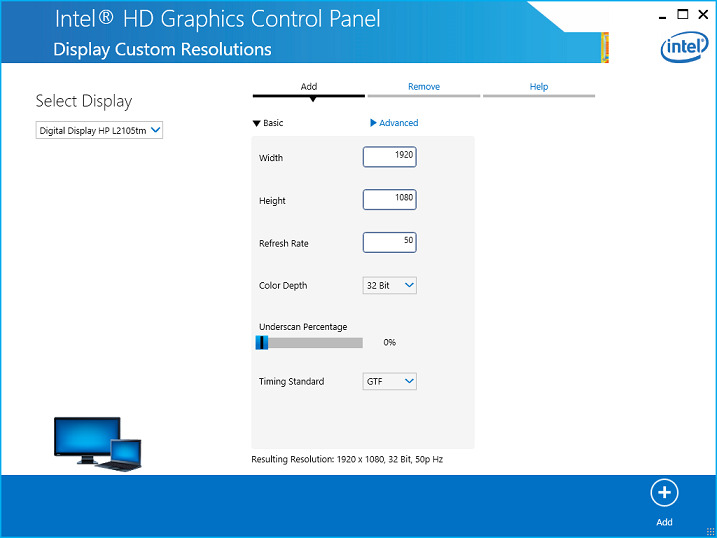 How do I access the Custom Resolutions/Modes feature in the Intel® HD Graphics Control Panel? 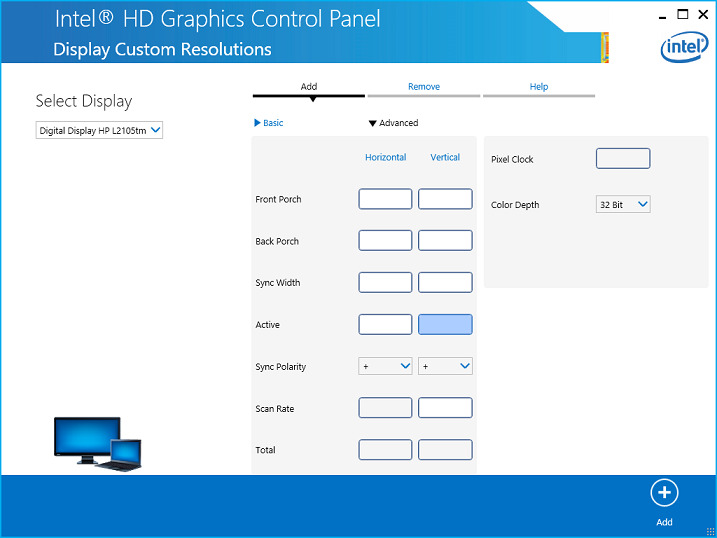 The Custom Resolutions/Modes feature was removed from the Intel® HD Graphics Control Panel. The driver still includes the feature. How do I enable the Custom Resolutions/Modes feature? 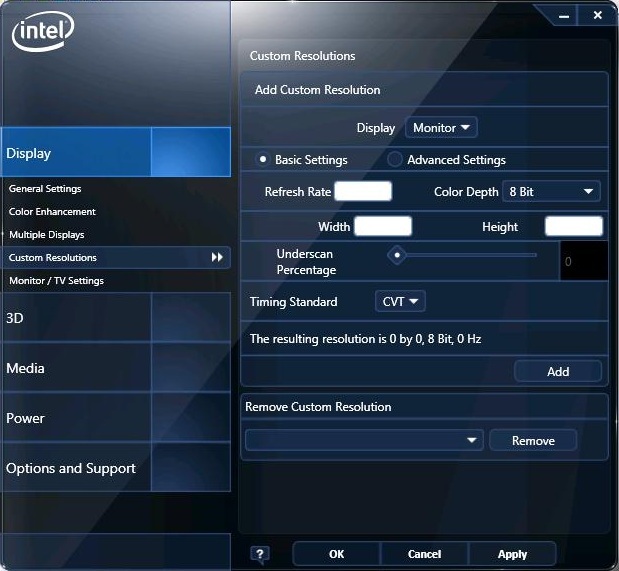 Contact your computer manufacturer to see whether you can add support for the Custom Modes/Resolutions feature. Computer manufacturers may not support use. Using the Custom Resolutions/Modes feature requires knowledge of the supported timing standards and parameters of your monitor. See your monitor manufacturer for information. We haven't tested and don't warrant the operation of the chipset beyond specifications. To use the Custom Modes/Resolutions feature, you must read and click Yes to a disclaimer warning message. What are the differences between the two setup tabs? Basic Setup/Settings tab: Add modes or timings based on existing standards like CVT non-RB timing (non-reduced blanking) for monitors, and CVT RB timing for digital displays. You can't use this tab with standard or high-definition television. Advanced Setup/Settings tab: Add modes or timings based on the detailed timing information of the display device. You can't use this tab with standard or high-definition television or a built-in display for a laptop. 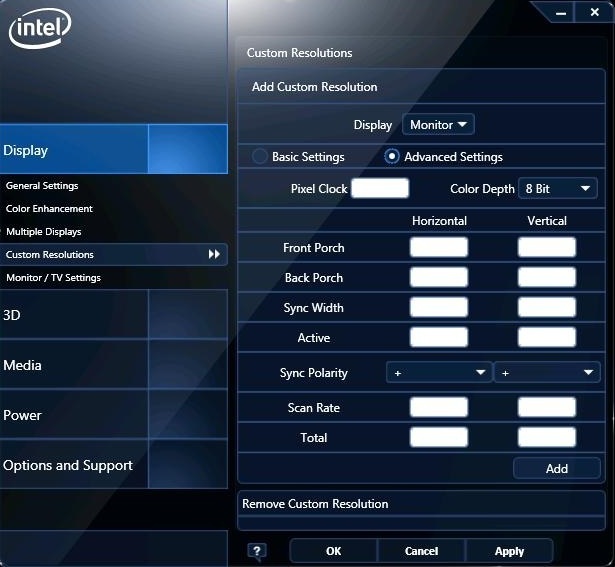 Note Not all computer manufacturers have the Custom Modes/Resolution feature enabled for Intel® Graphics Drivers. Older generic Intel Graphics Drivers don't enable the feature.